The cassia gum is the grounded and purified endosperm of the seeds of the cassia tora plant in the family of legumes. The plant is widely cultivated in Indian sub-continent, well distributed but in larger acreages in the province of Rajasthan. It also grows in the areas of the Himalayas in Nepal, Sri Lanka, west china and other tropical areas. The powder is pale yellow in color with a distinguishable smell. It readily dissolves in hot water and on cooling creates a viscous liquid. These groups of powders are referred to as hydrocolloids and are used as gelling agents in various industries. The cassia gum powder readily combines with other hydrocolloids such as the carrageen and the xanthan gum to form very stable and long lasting gels with very good texture. The chemical makeup of the plant consists of high molecular weight polysaccharides (up to 300,000 units) called galactomannans, which are the mannose to glucose ratio of 5:1 up to 8:1. Canned pet foods: the gum is used as a gelling agent in combination with carr It also enhances texture and appearance of the foods. Air freshener Gels, to provide the gelling property in manufacture of air freshener. It is used primarily as moisture retention agent, as a thickener and for ensuring the surface consistency of processed meats. It also enhances the palatability of the processed foods. This has caused an increase in demand for the cassia gum in the packing of processed foods. The key macro-economic activity influencing the market for cassia gum is the growth in meat and poultry processing, the dairy ingredients market, confectionaries and the pet food market. Currently, manufacturers are introducing the cassia gum into their ingredients as a good substitute to the synthetic hydrocolloids. The processed meat market is estimated to be more than 600 billion dollars globally by the year 2020. This will create a huge uptake for the cassia gum powder as manufacturers turn to it for their gelling and thickening processes. Canned meat products for Pets are another market segment that is bound to demand cassia gum granules. This is because it is stable in the food products and is generally regarded as an organic food. The ability to retain the texture in these processed meat means that protein and soluble fat content remain higher in value than the dried meat. It is also widely used in poultry processing and poultry recipes due to its stabilizing, thickening and emulsifying properties as well as the water retention characteristics. In poultry processing, research has shown that the product can remain stable in storage for up to 20 months without changes in the chemical structure. The gum also exhibits hygroscopic characteristicsup to a moisture level of 12%. It also has no interactions with the nutrient content of the foods. 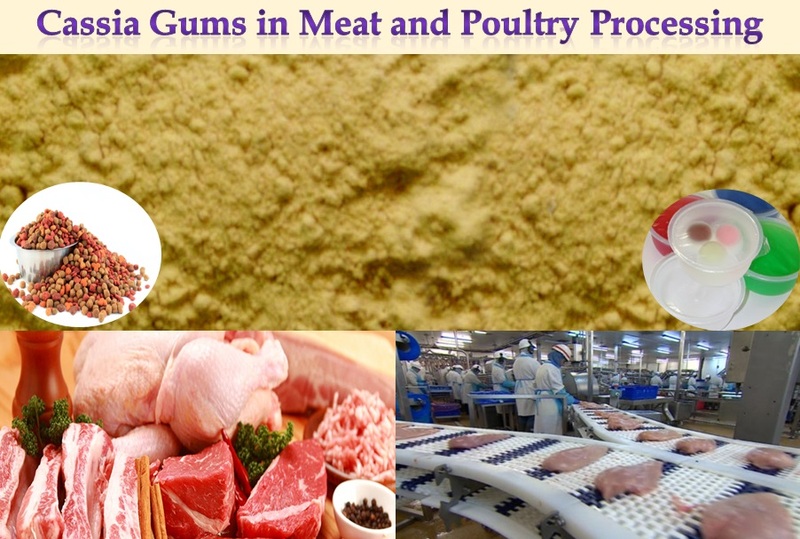 Cassia gum is rapidly gaining popularity in the food processing sectors mainly in meat and poultry products processing. This is due to its availability, affordability and effectiveness as a texturizer and gelling properties. The market demand is set to continue increasing with these positive factors. The biggest consumer of the guar gum powder is the petroleum industry. Its usage in shale gas production has been the single biggest usage. This caused a surge in demand for the product in the year 2016 and the trend will go on in 2017. The biggest producer of the guar is India (80%), followed by Pakistan (15%) and others at 15% of the total global demand. In India it is produced in the state of Rajasthan and Haryana. The year 2015 experienced a decline in production to 2 million metric tons from a high of 2.5 million metric tons in the period 2014/2015. The seed to Gum conversion ratio also stood at 27 – 33%. The production of the guar seed is also dependent on the monsoon rains, which could have caused the dip in production in the year 2015. The prices of the guar gum powder have now stabilized after a rapid decline caused by the crush in oil prices. In the past, the United State was the biggest importer of the powder and was primarily for crude oil drilling. Currently China is leading in the gas exploration and could be the leading market for the product. Substitution by the synthetic gums such as the hydrocolloids, xanthan and the tara gums will not be a major influence owing to the superior performance of the guar and the market price adjustments that have occurred. 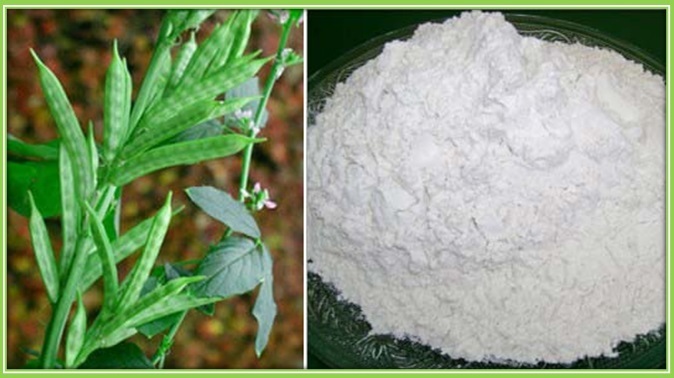 Apart from the usage in the petroleum industry, the guar is also widely used in the pharmaceutical industry, textile industry, food processing and most recently in the manufacture of explosives. This recent discovery is also set to create another demand pull which could trigger a price hike. This presents good opportunities for vendors in the current and forth coming years. The current inventory levels are becoming a substantial influence on the price of guar powder.The high levels kept by the shale producers could mean price stability over the coming period. Continued shale gas exploration will be influenced by the price of the crude oil. Over production of oil by the OPEC nations will translate to price stability rather than decline and shale exploration will be constant.The recent increased shale exploration in India has also created a local demand. The market segmentation of the guar gum is classified into grades and demand regions. Different grades of the product are used up by different industries. The grades are industrial grade guar, food grade and pharmacy grade. Thus production and processing of the guar powder is based on the final target market. Food-grade guar powder is highly refined and processed to meet the strict hygiene conditions. It is used as an additive in various products such as dairy,bakery, sauces, confectioneries and beverages. Industrial guar powder I used in oil refineries and gas exploration, while the pharmacy grade is used in manufacture of medicines. In the year 2017 to 2020, it is expected that the food-processing sector will contribute substantially to the consumption of guar Gum. This is due to increased reliance on convenience and processed foods across the world. 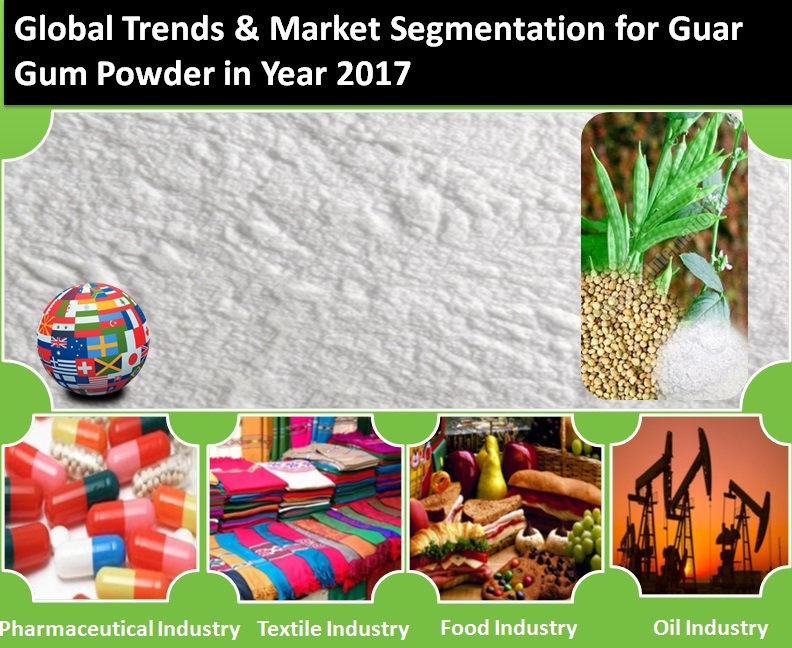 The shale gas exploration sector will also be a key determinant of demand for the guar powder.